Includes Regroover Pro and Beatformer plug-ins and a complete Point Blank online course. 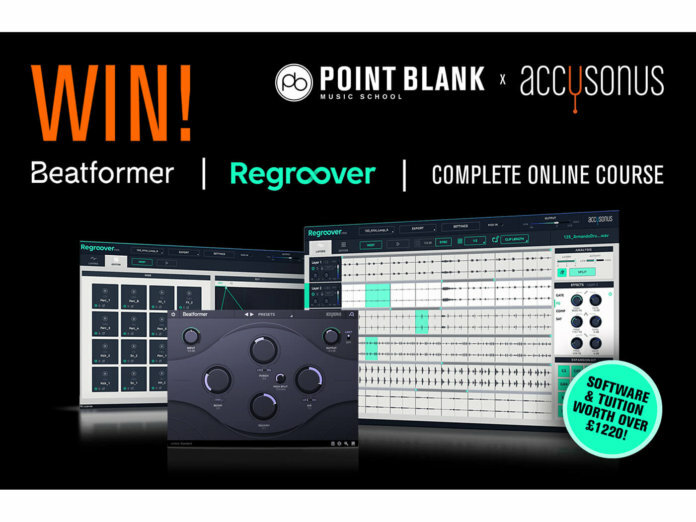 Point Blank has teamed up with Accusonus for a competition that’ll send music producers reeling. The first prize winner will score a huge bundle that includes the Regroover Pro and Beatformer plug-ins, as well as one of Point Blank’s Complete online courses. The latter lets you pick from the Complete Electronic Music Production, Complete Mixing and Mastering, Complete Sound Design programmes and much more. The total value of this prize amounts to a whopping £1,220. The two runners up of this competition will also be rewarded handsomely: a copy of Regroover and Beatformer each. All you have to do to stand a chance to win is submit your best track via Plugged In before 26 April. Click here to enter. For more information about Point Blank’s courses visit pointblankmusicschool.com.